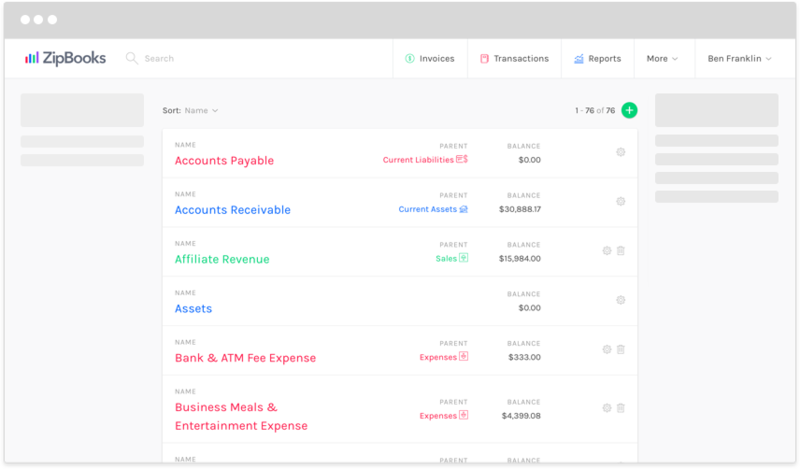 ZipBooks organizes everything in one easy-to-use location with a Chart of Accounts—known inside the app as Categories—so you can keep on top of each of your accounts as needed. Look up the total amount of your inventory, make sure your accounts payable aren’t overdue, or check out how much cash you’ve got on hand in a snap. ZipBooks automatically generates a group of accounts for your business. These are things like Accounts Receivable, Expenses, Revenue, and Accounts Payable. We’ve analyzed the most common and helpful categories, so your defaults are a great place to get started. As these categories are very general, you can easily create others that more accurately specify your business activities. In order to get deeper insight into where every penny of your money is coming from, and exactly where it’s being used, you can easily create additional accounts that are customized to your business. For example, you might separate revenue into Sales Revenue and Service Revenue, or you may specify the different types of expenses you incur, such as Office Snacks and Office Supplies Expense.